I broke my own rule this week. I went to a place the second day it was open. I always give a restaurant or brewery a month to work out all the kinks that comes with opening. However, the growing excitement behind Mindful Brewing Company had me entering the doors on the second day it was open. I live close to Mindful and have watched it grow from the first piece of lumber to the night it turned it’s light on. On opening night I saw a full parking lot and still thought I would give it a few more weeks. I was really wrong and happy I was. In my opinion the toughest thing for breweries that serve food is to get both the beer and food right and make the customers happy. Mindful Brewing Company got all three right. They made some smart decisions for the customer by adding themselves to the No Wait App. I was able to call ahead and then received a text that we were in line and I hadn’t even left my house yet. I checked the No Wait App and it is in the “coming soon” stages. Huge bonus as a customer. Each beer had a unique taste and we could taste a different between the coffee porter and non-coffee porter. I enjoyed all of them but my favorite had to be Putin’s Revenge. They have a huge tap system at a downstairs and upstairs bar and in addition to their own brews they carry a lot of local beers like Grist House and Helltown. They also have wine and cocktails on tap. This is where I was a bit skeptical. Especially the cocktails so I tried the Mana-hatta. It was great and not too sweet and watered down. The food that Mindful Brewing Company has boasts of grass fed and farm to table. 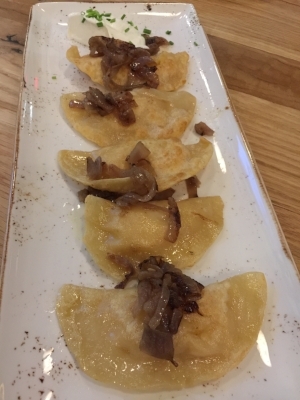 We started with the Perogies, because we are in Pittsburgh after all. They were prepared fried with onions and a heaping glob of sour cream on the side. I ordered the gourmet grilled cheese with fries and a side of mac and cheese. First the Mac and Cheese is superb and should be it’s own dish with steak or chicken or something. It is creamy and warm and was fresh. The grilled cheese was interesting with a few different cheeses and I added bacon. The fries could have been crispier, but that is a personal preference. The other plate I got to try was the caramel apple burger. This was interesting in the taste of sweet mixed with the burger. The burger is grass-fed and you could actually taste the meat. It wasn’t over seasoned or ever prepared. In a word: Perfect. I always try to have dessert wherever I go and Mindful enticed me with a dessert perogie. It was a fried perogie filled with cream cheese filling and walnuts with a caramel drizzle. Ice cream can be added. It was delightful. Mindful Brewing Company got the perfect combination of brews, fun and great customer service all in one. At the corner of Castle Shannon Blvd and route 88, Mindful Brewing Company has a great amount of parking and in walking distance to a trolley stop. For more information check out http://mindfulbrewing.com/ or Facebook and Twitter pages. Cheers!